Human rights treaties are at the core of the international system for the promotion and protection of human rights. 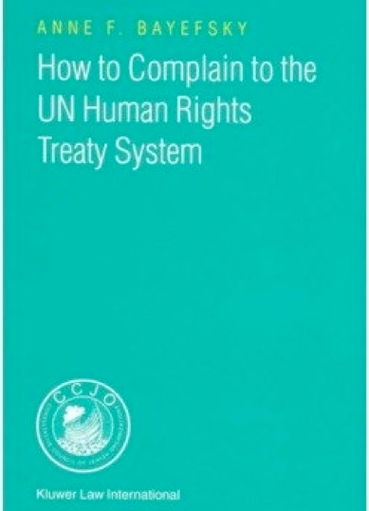 The aim of this book is to empower individuals with the knowledge of how to use the UN Human Rights Treaty System to complain to an impartial international body about violations of their rights by states. Although this right is limited to claims against states that voluntarily permit complaints to be made against them, the UN human rights treaty system now applies to one-quarter of the world’s population. It is of vital importance for individuals to understand the procedures of putting the mechanics of the human rights treaty system into practice if the potential of the system is to be realized. Dissemination by human rights advocacy groups and by the UN itself of clearly defined actions and steps that can be taken by individuals to initiate a complaint is a challenging task. This book provides a clear explanation of the complexities of the UN human rights treaty system and the methodology to employ its procedures to successfully navigate a claim through its proper course. Key beneficiaries of the information presented in this book are the individual victims of human rights abuses for whose protection the UN human rights treaty system was created. Human rights organizations, advocacy groups, government agencies, and all practitioners working to confront the widespread incidents of human rights violations around the world will find this volume a useful ally in providing the practical knowledge and tools needed in their common struggle.